The Kodak Gallery at the National Museum of Media in Bradford takes the visitor through the history of photography. 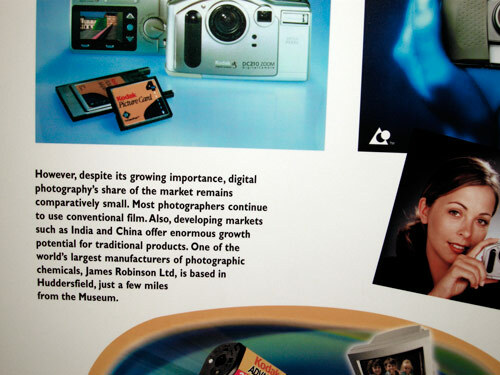 The last explanatory poster on the wall of the gallery is entitled ‘The New Millenium’, and shows the Millenium Dome in London, an APS Advantix film camera, a Kodak DC210 one megapixel camera and a 4MB compact flash card. And it has a description of the then-current state of photography in the year 2000 that boggles the mind with how much things have changed in the eight years since then. It has been amazing for sure! Now you can get the GB cards that are High Capacity Cards!